Decorative Rechargeable LED Vintage Oil Table Lamp with Blow ON/OFF Control,Dimmer Control Key to LED Candle Light Intelligent light control for better life. 2Please keep the key on "ON", the blow controlling function will be on.Blow the LED light,it will on,Blow again it will off. 3.If don't use it in a long time,please keep the Key on "Off".Then blow conrolling function wii be off. 5.charge:it needs to be charged when no light of item.The lamp can be used continuously 4 hours to 20 hours after full charged(Depend on brightness). 6.Adaptor specification:The product can be charged by computer or adaptor.If you have adaptor with USB port or other suitable adaptor. Adjustable LED light, blow function to turn on/off the light. Use dimmer switch to control the bright of LED light, rotate the switch counterclockwise to darken the light and clockwise to brighten the light. USB charging function,inside 600mAh environmental rechargeable lithium battery for safe, convenience and long serving life. 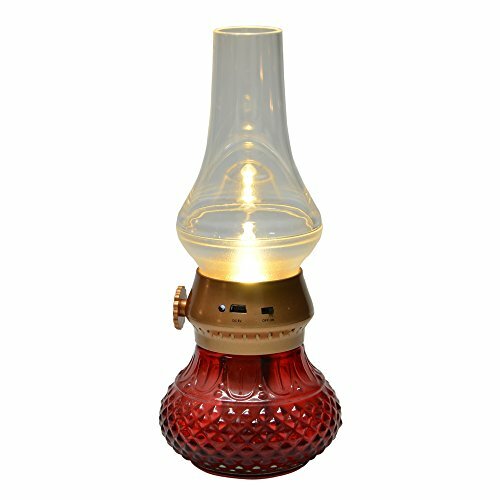 Vintage style lamp body in plastic and base in glass, has a good stationeriness. No worry about rolling over. Ideal for dating night, room, romantic dinner, reading light etc. If you have any questions about this product by YAKii, contact us by completing and submitting the form below. If you are looking for a specif part number, please include it with your message.